As a consumer, what do you consider to be the easiest, fastest, and most convenient way to have a message delivered to you? Postal mail is slow and costly; phone calls can be quick and simple, but are not always convenient; email is instantaneous and more accessible now with smart phones, but only about 26% of all emails are ever opened. 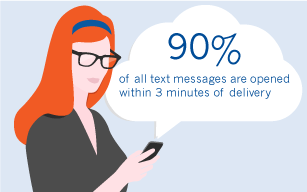 Today, text messaging is a dominant form of communication, with 6.3 billion messages sent per day in the US alone. Considering that more than 99% of all text messages are opened, this could be an extremely effective way for your organization to communicate with its audience. Keep in mind that the Telephone Consumer Protection Act (TCPA), detailed in our whitepaper, requires businesses to obtain prior written consent before contacting consumers on their wireless devices. Is it worth it to ask permission of your customers to send them text messages regarding your business offerings and updates? With customers’ prior authorization, businesses of all industries can email through the SMS gateway to deliver their message as a text message 90% of which are opened within 3 minutes of delivery. A reverse phone lookup API can easily provide the corresponding SMS addresses for approved wireless phone numbers, to which you can send a short email to arrive as a text. This allows for mass communication that is brief, immediate, and direct, making it a powerful way to grab users’ attention. Make spur-of-the-moment offers to your customers. As exemplified in the figures mentioned above, a much higher percentage of text messages are opened and read as opposed to emails. If you want to promote a limited time offer, emailing through the SMS gateway is a cost-effective way to spread the message, and is more likely to generate returns. Reminder services help save both the business’ and the customer’s time. When consumers make appointments or order deliveries, many may appreciate the option to receive SMS reminders as the appointment or delivery time approaches. The urgent and direct nature of a text message makes it a fitting reminder service, and is bound to decrease the number of missed appointments, postponed meetings, and undelivered packages. Notify your users of emergencies or warnings. Many organizations can make use of emergency communications with text messages. At the University of California, Santa Barbara, many students and faculty opt in to the UCSB Alert Notification System. The system immediately alerts participating community members, via text message, of any crime or suspicious activity on campus and in the vicinity, spreading awareness and helping safety and security efforts. In another instance, if you are putting on an event and the parking lot becomes full, a text message may be the best way to notify attendees and direct them to another parking area. Save paper with digital receipts. Emailed receipts are becoming more commonplace, but depending on the business and commodity, texting customers their receipt through a messaging service or the SMS gateway could be another option for digital receipt delivery. With the proper technology, businesses using digital receipts save paper and ink. As with postal mail and email, choose wisely and sparingly when communicating through the SMS gateway so as to avoid having your messages classified as junk mail or spam. Emailing to a large amount of recipients’ cell phones is an easy way to market to your audience, enhance customer relationships, and even increase business efficiencies. DOTS GeoPhone Plus 2 is a reverse phone lookup service that appends SMS addresses (along with more contact information) to your database of customer cell phone numbers. Don’t forget about the TCPA, and make sure to acquire permission from your customers before reaching out to them on their cell phones. You can then email to the approved SMS addresses in your database, achieving massive reach and immediate contact.